Well, first off, every tournament-winning pick I've made for the past couple of weekends has been off! Anyway, it looks like Roger Federer's feeling good again with great results his last two times out, particularly with a great run in Monte Carlo. Steve at Top Spin Tennis notes while it was a great week for Rafa Nadal, the story really was R-Fed. "Well, my serve is my weapon. My serve still goes through the court. When I get my first serve in, it's pretty effective here. Then on my groundstrokes, I just have a little more time to set up and take a swing at the ball." Think about that Andy and James. Just for Sam saying that, he gets his picture on the blog! The week ahead on the tour should be interesting: The men play in Monte Carlo and the women have the Fed Cup semis. While I'm a die-hard Davis Cup fanatic, the Fed Cup has never captivated me as much—primarily because you never have an idea what the teams are going to look like, and some major mismatches can occur. Take the U.S./Russia match-up: This is going to be rough. It's a great opportunity for the U.S. players going, but come on! At this point of a competition, the big guns should be coming out. The Spain/China matchup should be intriguing, at least. I won't break down the whole Monte Carlo draw, but I'll tell you this: For my ATP Masters Series challenge bracket, I picked Roger Federer to win the whole thing! I think this nice run in Estoril really helps get him back on track. I just realized though: With his clay-court schedule being so heavy this year, I hope he doesn't decide to bag on Monte Carlo. That would definitely take me out the running for the ATP prize! There's NO way he plays all three Masters Series events on clay: I guarantee it! Oh Van, when will you learn? One of these days I'm going to realize that I should always pick a Williams sister to win: I'll look so smart then! • Maria Sharapova will go back-to-back, taking out Serena Williams and Jelena Jankovic along the way to win her second title in as many weeks, this time in Charleston. I think those two (and Elena Dementieva, who's also still in the draw) are better dirt-ballers than Maria, but the way she's been playing this year has been Williams-like, to say the least. • Nicolas Almagro (he of future top 10 as predicted by Tennis Talk, Anyone? fame, will bag his third title of the year in Valencia. That Juan Monaco matchup will be tough, but I see my man Nic getting through. Three's the magic number for him here because he'll also be going for his third Valencia crown. • James Blake breaks through on the clay at the Houston Challenger. What's that you say? It's on the ATP big boys calendar? I couldn't tell with the draw looking like it did. If JB says, "Hey, I'm the only big dog here; they should start engraving my name on the trophy now," he'll be in good shape. He just can't doubt himself, particularly with facing Augustin Calleri next. 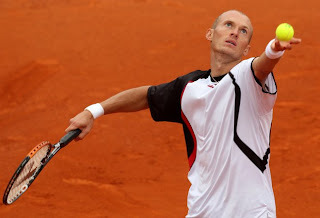 • Since he just broke streaks in Miami against two guys that owned him, Andy Roddick and Rafael Nadal, Nikolay Davydenko should be able to maintain his form and take out Roger Federer in the finals in Estoril. I'm going with Maria Kirilenko or Tathiana Garbin to pick up the women's crown. Another Davis Cup weekend has come and gone (man, how about that Richard Gasquet? and now the clay-court season really kicks into gear. The women had their first big tournament in the spring swing and Maria Sharapova bagged her first title on the dirt. But with tournaments a-plenty this week (the men are in Valencia, Houston and Estoril, and the women are in Charleston and Estoril, too), the biggest news this week is Roger Federer bringing in Jose Higueras (both pictured above) to help out some as he ramps up his clay-court preparation earlier than usual by hitting Estoril. Now, I have some concerns about this move. First, why Higueras? I know Higueras helped Michael Chang and Jim Courier win French Opens, but that was a looong time ago. Higueras helped those two by teaching a hard-court player how to play on clay and getting a temperamental freak-out machine to realize he didn't have to blast winners all the time (Chang and Courier, respectively). Basically, I think Higueras gets guys to play within themselves, or in the case of Robby Ginepri, motivates them to work harder. But Federer's a completely different animal than those three as his game is way more free-flowing and versatile than theirs. If he gets Federer to dial down his game, I think it can be disastrous. Second, if Federer feels he needs a coach, which I think he does, too, why go with someone so surface-specific? So after Estoril and if they go through the clay swing, does he dump Higueras? There's no way Higueras can help Federer at Wimbledon. Or during the hard-court season, for that matter. I hope it doesn't look like I'm always dumping on Federer, I just think he's at a crucial point in his career where the wrong move can snowball. I think this working-with-Higueras move is almost like hitting the panic button. 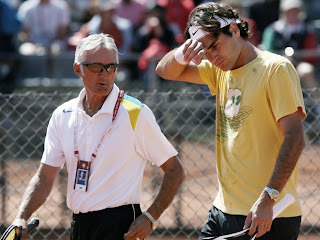 Know who I wish was still around coaching that would be good for Federer? Tony Pickard. He got Stefan Edberg to the finals of the French back when the players were practically playing on mud, and Edberg did it by attacking. But Pickard's so far removed from the game there's no way that would work. I have some other ideas on possible Federer coaches, but I'll save them for later—or I might just shut up about them if the Higueras thing works out! Stay tuned. Forget my Miami recap, it's Davis Cup time! 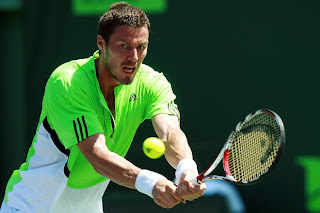 Marat Safin (RUS) vs. Tomas Berdych (CZE): Now logic dictates that a young player (Berdych) coming off one of the best results he's had in almost a year, should be able to take out a former number 1 (Safin, pictured) mired in a horrible slump. But if you've followed Davis Cup at all, you know crazy things tend to happen. That being said, I'm picking Safin: The home crowd will be behind him, which I think will definitely rattle Berdych; he obviously must have done something good in practice this week, forgoing the captain to put him in this spot; and he's Marat Safin! He can beat anyone any time if he's focused. Philipp Kohlschreiber (GER) vs. David Ferrer: Now everyone knows I always pick my man Phil in matches even though it might not be the way to go. But I'm gonna have to go with him here (seen here clowning with teammate Nicolas Kiefer, right, at practice) in the upset as he's playing at home on a fast hard court. Ferrer will fight tooth and nail on anything, but I think he comes up short in this one. 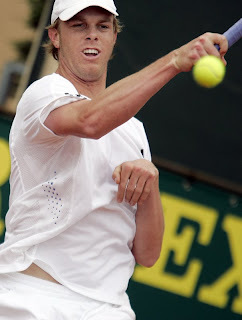 David Nalbandian (ARG) vs. Thomas Johansson (SWE): Johansson is a gamer, and is capable of shocking anyone. 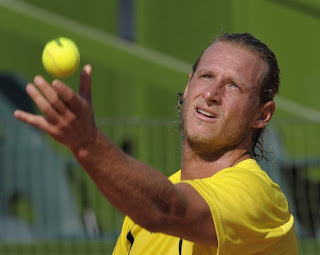 But that won't be the case this time: Nalbandian (pictured practicing) should win this one pretty handily. A question for anyone out there: Why can't Swedish pros play on clay anymore? Andy Roddick (USA) vs. Michael Llodra (FRA): Injuries on the French side wrecked this dream quarterfinal tie, with both Richard Gasquet and Jo-Wilfried Tsonga both out. 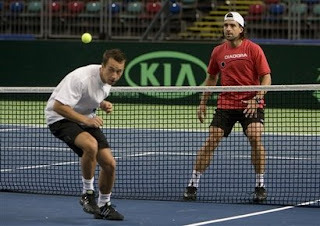 However, Llodra should be able to push Roddick (right) around some. Still, I expect A-Rod to get through. I sure heart Davis Cup! Somehow, some way the guy has the capability to just dust dudes once he gets on a roll, just like he did at this tournament. Then I figured if he could end one losing streak, like he did against Andy Roddick, why not wipe out another against Rafael Nadal? Anyway, congrats Nik, old boy, and I'll wrap up Miami in my next post. • For one, I think the home-court advantage will be huge. Serena feels an affinity for this tournament and crowd unlike anywhere else she plays. So even if she gets down, she'll be looking for the crowd to lift her, which they will be more than happy to do. • She's in really good form, at least mentally, and I think what really demonstrated that was her win against Svetlana Kuznetsova. Beating Justine Henin the round before was good, but Henin hadn't been playing as much and I think was a little rusty. Svetlana is as fit a player as there is on the tour, and Serena toughing out against her is a good sign, particularly from a mental standpoint. • Speaking of "mental standpoints," while I think she's made strides, I just don't see Jelena overcoming the moment. This is the biggest final of her career, and with the crowd against her, too, it could be a tough road to hoe out there. But I think this final will do her good for the future, just not today. I'm expecting a three-set final, though, but Serena will win 6-1 in the last frame. Howzabout that A-Rod! And me, too, after picking Blake to win the day before, Andy comes through for me! 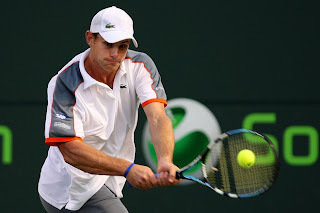 You know, why not tonight for Andy Roddick to break his losing streak against Roger Federer? If he protects his serve like he's never protected it before, get into some breakers, grab a mini-break or two in said breakers and who knows? Now's the time to do it. Following the live scoring on the Sony Ericsson Open Web site shows it's 4-4 now. The first breaker's only two games away! 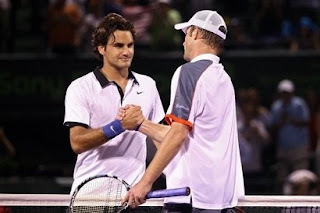 Roddick, 7-6 (6), 7-6 (4). That's my pick and I'm sticking to it! And if I blow it, I won't write as long a post as I did explaining my bad Blake pick. Promise! The year was 1997. The place: Citronelle, Alabama. The setting: The annual Valentine's Day tournament, one of the stops on the non-USTA-sanctioned tour throughout Alabama that used to go on (I don't know if those tournaments are still around since I haven't lived in Bama since then). Somehow, I had scraped my way to the finals of the "A" bracket, and my opponent was none other than my doubles partner, with whom I had already clinched a berth in the finals with earlier in the day. We were high school teammates, but didn't play doubles on the team together. We started doing that after we both graduated and my regular partner for USTA tournaments moved away. We had some success, though, picking up a couple of tournament wins during our partnership. Most of our time on a court was spent on opposite sides of the net, where we played on average three times a week, for at least five years. Most of those battles were on my home court in the apartment complex I grew up in. It pretty much became his home court, though, because if you think Andy Roddick has a losing streak against Roger Federer, it's NOTHING compared to my losing streak against this guy. When we were on the high school team together, I was one of the top two players, while he was barely hanging on the bottom rungs of the top six. However, whether it was us constantly playing or what, he definitely got better. I always thought I should beat him, even though it got to the point where I barely had a shot against him. Anyway, back to this particular tournament in Citronelle: By this time, I must have lost dozens of matches to him in a row. We had met in the finals of a USTA tournament in Birmingham two years earlier and he beat me in three sets, which was among my better losses to him. However, this night, I was determined to break the streak. The tournament was on a hard court (as most tournaments in Alabama were) and this court was particularly favorable to my game, I felt. 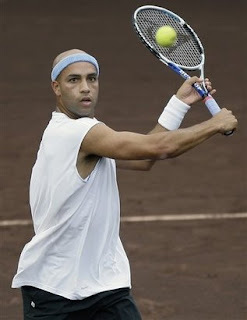 I've always been a baseliner, and though I play mainly now on clay courts, back then, fast hard courts were my favorite. I'm a good returner, and faster surfaces helped my so-so serve and relatively flat backhand. Even with my friend being a serve and volleyer, I knew whenever we played on a faster surface I was able to give him more fits. So I felt really good going into this match. I lost the first set 7-5, but I was hitting passing shots and winners from all over the place. Despite dropping the first set, I was still confident heading into the second, which I won 7-5. Before every point over those two sets, I was shaking my head "no," just to focus on the moment. However, at the start of the third set, the slightest bit of doubt started creeping in. He won the first game, then I won the next ... and that was it for me: I went down 6-1 in the third. The weight of his competitive spirit just smothered me. I had him on the hook and didn't come through, even though the conditions were completely optimal for me. Seeing James Blake lose today to Rafael Nadal (despite my picking Blake to win) kind of dredged up these old memories for me. Despite a favorable situation, the mental aspect of the game is just as important; something every tennis player knows. How does Blake bounce back for the next time he has to play Nadal from losing those two matches in back-to-back tournaments? I'm definitely the wrong guy to try to figure that out! And back to Citronelle once again: We wore each other out so much in the singles final, we lost the doubles in three to a team we had waylaid in our last tournament. That's tennis, I guess. 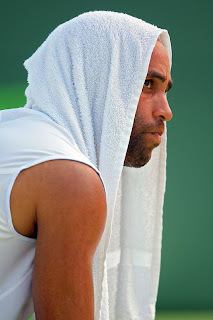 Rafael Nadal (2) vs. James Blake (9): Now THIS will be a match to see! The two just came off a great battle in Indian Wells, with Nadal picking up his first win against Blake after going 0-3 against him in their careers. Technically speaking, from a tennis standpoint, Blake should be able to beat Nadal pretty much any time they get on a fast surface, particularly hard courts. But Nadal is a first-ballot Hall-of-Famer and definitely won't go down without a fight, especially to someone who's had half the career he's had. Enough of the preludes: Here's how it will go down! I'm going with Blake on this one, but he has to do it quickly. He can't get into a third set with Nadal, because then it gets down to intangibles, where Blake definitely takes a backseat. I think that even though he lost to Nadal last time they played, it was more a matter of him letting Nadal off the hook, something he's done a lot of times in his career against other players. Nadal's topspin doesn't hurt Blake on either side because Blake's as strong a player as there is out there. His flat shots cut through Nadal's spin and Nadal doesn't get to yank him around the court as much as he does other players. Nadal should be confident going in: Going by the rankings and career stats, he should see himself as the favorite. But it's all about matching up game against game, and his just doesn't go up against Blake's as well as it does others. So my scoreline on this match, 7-6, 6-2 for Blake. If it goes three, that should favor Nadal, but honestly I don't think it'll go that far. Bob Bryan/Mike Bryan (1) vs. Simon Aspelin/Julian Knowle: While Roger Federer's struggles have been well-documented, his counterparts on the doubles side are also slumping in a big way. 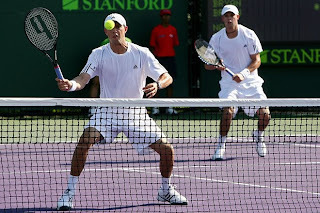 The Bryans (pictured), who I think have the tools to be the best doubles team of all time, have yet to win a tournament this year (although, unlike Federer, they're at least making finals). Reigning U.S. Open champs Aspelin and Knowle can definitely go into this match with a lot of confidence. Like I mentioned in an earlier post about Miami being the most important tournament of Federer's career, I think the same can be said for the Bryans here. Lindsay Davenport/Daniela Hantuchova vs. Katerina Srebotnik/Ai Sugiyama (2): You would think based on sheer power alone, LD/DH should be able to blast anybody they face off the court, but Srebotnik and Sugiyama are as veteran a pair as they come, and while they might be kind of on the slighter side in this match, bet on them coming through. They know enough to keep Davenport and Hantuchova (who, don't get me wrong, are both good doubles players) off balance. Mahesh Bhupathi/Mark Knowles (4) vs. Paul Hanley/Leander Paes (8): Since the "Indian Express" has been off track for a few years now, it's always intriguing to see Paes and Bhupathi on opposite sides of the net. Bhupathi and Knowles have been one of the hottest teams on tour this year, while Paes and Hanley (pictured) have yet to click. I'm rooting for Bhupathi and Knowles to come through because: A) I like Knowles and I thought it was pretty lame for Daniel Nestor to break up their long-running partnership, so I hope Knowles gets the last laugh and B) I'm not that big a Paul Hanley fan. I think Leander will find out, just like Kevin Ullyett did, that Hanley is not clutch material. Arnaud Clement/Michael Llodra (7) vs. Jeff Coetzee/Wesley Moodie: Based on the shot-making ability alone of Clement and Llodra, this match should be highly entertaining. Both of these teams are kind of built similarly: Powerful shot-makers (Llodra, Moodie) paired with smaller, steady guys (Clement, Coetzee). The seeded French pair should be able to top the solid South Africans, who have had a pretty good year. Victoria Azarenka/Shahar Peer (7) vs. Svetlana Kuznetsova/Amelie Mauresmo (WC): This is an interesting matchup, with these four being primarily singles players. However, I think this match is most important to the sole future Hall-of-Famer in the bunch, Mauresmo. Her confidence could really use a boost. And a good thing about watching doubles, you get to see four players for the price of two! Admittedly, I didn't see that coming. I guess as far as Serena's concerned, if all her matches could be played against Justine Henin in Miami, it would be a good thing! 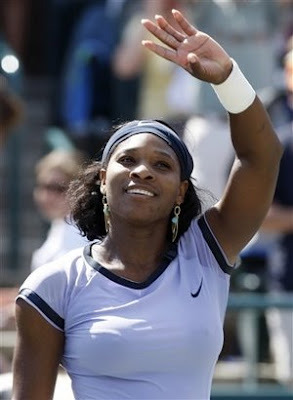 I'm interested to see how Serena will do against Svetlana Kuznetsova, who took out big sis Venus. Two things Kuznetsova has going for in a match with Serena is that she's fit and she's not rusty, as she and Jelena Jankovic are two of the most active players on the WTA tour.